We’ve decided to publish our research to shed some light on possible impact that Pinterest as a social media channel may have on Google and also – how Pinterest search engine works itself. The results and final conclusions are based on a case study of one of my campaigns for a lingerie wholesale site. This research is definitely for more experienced and advanced Pinterest’s users. As it contains a lot of examples, proofs of my research and results that my campaign has brought, it might seem to be difficult for the readers interested not enough in the Pinterest SEO field. My purpose was not to write an easily readable book but to share a very important (from my point of view) information. I am an entrepreneur and a researcher rather, not a book writer. There are many tips on the Internet concerning strategies of Pinterest’s campaigns. I must say, that personally I don’t agree with many of them (for me, they are not effective enough and don’t lead to a real success). The main goal of my campaign was to create an account strong enough to conquer both: Pinterest and Google search engines. And I did so. That is why this publication is the essence of an effective and successful campaign only. No wasting time for unproven or time-consuming methods, just a simple recipe to succeed. At the beginning of March, while many Pinterest users started repining my photos and following my account, I thought to myself that this might be a great method to promote Lingerose.com. Not only directly from Pinterest. I checked Google and typed in “Lingerose” query. In the 10 first results all of them were for Lingerose’s account of most important social media (Facebook, Twitter, Google Plus, Linkedin and Pinterest). At that moment I realized that Pinterest may have huge impact on SERP in Google and might be a great tool from SEO’s point of view. To be honest, I don’t even remember when exactly I have started and created Lingerose’s Pinterest account. It was about October/November of 2012. According to Pinterest stats the first day was the 1st of November 2012 – so I think they are right. Hold on – I’ve just checked my emails from Pinterest. From the 1st of November there are stats available. I created Lingerose’s Pinterest account even two months earlier – it was the 8th of September 2012. It doesn’t change anything because those first months weren’t very exciting and there didn’t happen a lot. 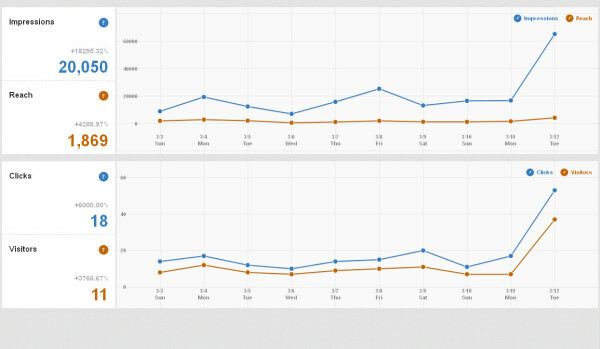 I didn’t add many pins as you may see from the site’s metrics (Nov 01, 2012 – Mar 02, 2013) in total – 133 pins. Including September and October – maybe about 200. The most “pinning” day was the 30th of January 2013 when I added 19 pins. 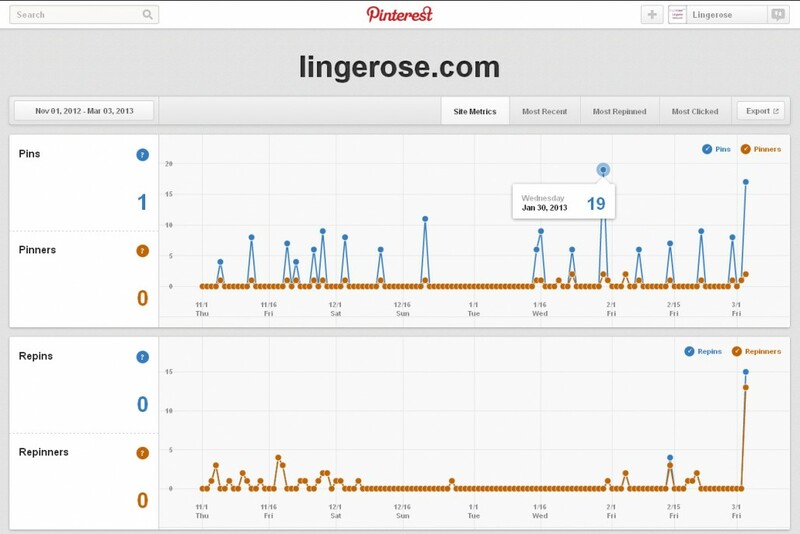 As you may see there weren’t a lot of impressions of our pins and visits from Pinterest to Lingerose.com. The busiest day was the Valentine’s Day. So, the period from the beginning of the 8th of September 2012 to the 2nd of March 2013 was quite boring. I created about 5-6 boards and tried to add pins once a week. This way I reached about 20 followers in … the 6 months time. In general, Pinterest seemed to be interesting to me because it was all about photos and you should know Lingerose’s products have great, high quality photos. But with no possibility to show them to many users, my Pinterest’s adventure wasn’t successful at first. Just another social media account for Lingerose Network. The 3rd of March 2013 – the day of glory. Yes, this was a very special day – I opened email from Pinterest and saw a Group Board Invitation. At the beginning, I wasn’t sure what it was. After two minutes of investigation I thought to myself – this is it! By the way, thank you “Olga Zavare” – whoever you are (her account’s gone – probably another fake account). First days in a group board weren’t too crazy. I wanted to check and see what it is all about and how it works. Average of 14 pins daily were added and I noticed that people liked my pins and they’re willing to repin them. At that time the stats were not available yet, so I counted all the signals (likes and repins) by myself. I was thinking about the best strategy and I knew, I had to organize and order my account, creating new boards with proper names and with many relevant photos. So, it was a good chance to improve results and do some research on Pinterest itself and its impact on Google. On Monday, the 11th of March 2013, I decided to focus on Pinterest and started documenting all the actions and results to publish them at Lingerose’s blog … and that’s how it started. This was the most important and common term of all the scientific theories and researches at the University of Economics where I studied. When we want to verify any thesis or check if something simply works, we need to remember that all the other things should be equal or held constant. So, to see if and what impact Pinterest has on Google, I knew, I had to create a kind of isolation from other sources that might affect Lingerose’s SERP in Google and to be focused on Pinterest actions only. 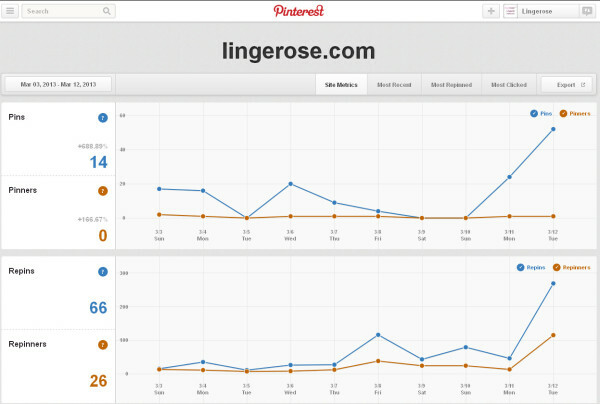 Fortunately, for the purpose of this research, there weren’t so far any SEO actions done for Lingerose.com domain. Except for friendly URLs and the fact that domain was registered in 2009. No link building or other SEO methods that could have an impact on SERP. All the social media activities done before March of 2013 didn’t affect Google. For the most important search query – “lingerie wholesale”, Lingerose.com were out of the first 20 pages of results (200 results). 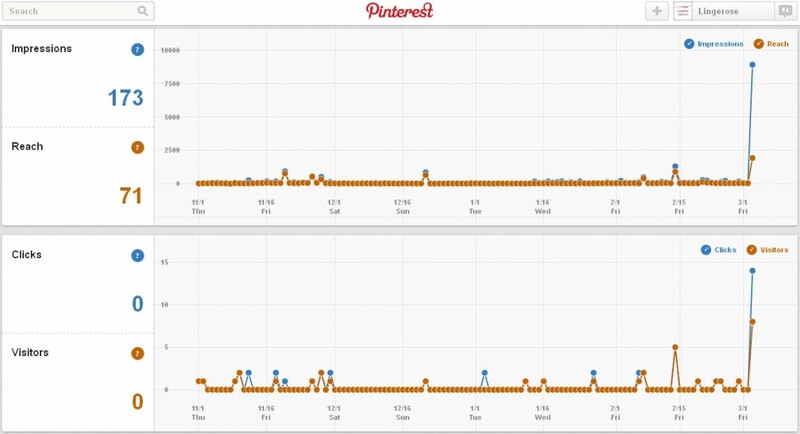 As you may notice above, there was a huge chance that information and results I was going to gather might have reflected a real correlation between Pinterest and Google. All the photos have been added and repined manually. No automatic tools, no cheating. Just me, Lingerose.com, Pinterest and hard work. Because it’s all about pinning.